Embrace the Aztec-southwestern style with this super cool bag! The eye-catching, design is fun and out-there with bold graphic patterns in shades of royal, white and orange on a navy blue backdrop. 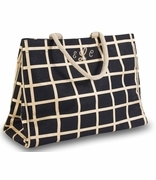 Two wide rope covered navy blue handles finish off the look. Use it for a weekend outing, a day at the beach or the pool. Pack it with last minute getaway necessities for carrying on flights, fits nicely in overhead compartments. It is versatile and oh-so trendy. For added pizazz, we can embroider your name onto the front in a bold font! Add the matching shoulder tote search item CC-BB1-03899 and accessory pouch CC-LCB00713 for a complete set for yourself or a milestone Birthday gift for a friend. The perfect gift set for bride or college bound niece. The Santa Fe duffle measures 28"W x 15"H x 9" across the bottom. Inside zip pocket and zipper closure. Over the shoulder strap.